Unilevel is a simple and easy plan to understand. 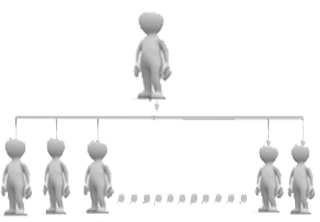 In Unilevel plan each member can register unlimited down line members in his first level and his down line members can also register unlimited down line in his first level and so on. This plan allows you to enroll one line of distributors, therefore everyone you sponsor is on your frontline and commissions are paid on a limited depth. The goal of generation plan is to recruit a large number of frontline team members and make them to do the same. Unilevel plan is very simple in structure and function. In this plan, beginners do not advance to locations above basic distributors, regardless of their performance. The main advantage of the Unilevel plan is that it is very easy for companies to manage and for distributors to explain to possible recruits. Its main disadvantage is its lack of flexibility in attaining some of the objectives stated former. In total unilevel plans are restricted in depth of levels of payment which restrains sales organizations.